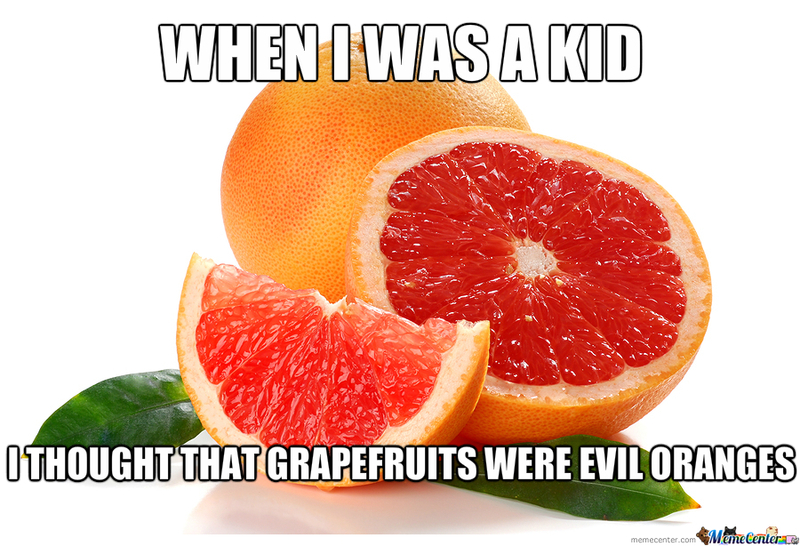 Grapefruit was first known as “forbidden fruit” after its discovery by Rev. Griffith Hughes in Barbados, circa 1750. It has since earned status as one of the ‘7 Wonders of Barbados,’ which also include a cave, a tree, a mill, a synagogue, a cannon, and some mansions. Apparently an eight item (coral reefs) has recently been added to the list, as well. The fruit comes in a few varieties, including white, ruby red, pink, golden, and star ruby (the darkest of the hues). Grapefruit even has its own special spoon, complete with serrated teeth at either the tip of the device or on the sides, used to cut the flesh from the rind. Although discovered in Barbados, the country doesn’t crack the Top 10 list for producers of the fruit. The United States grows over 1,500,000 metric tons of grapefruit each year, dwarfing their nearest competitors. Also cracking the list are China, South Africa, Mexico, Syria, Israel, Turkey, India, Argentina, and Cuba. Speaking of China, pomelos have been nicknamed Chinese Grapefruit and are very popular around Chinese New Year for their resemblance to the moon. One of the leagues for Major League Baseball’s spring training has been dubbed the Grapefruit League and plays out of the Florida area, while the Cactus League takes place in Arizona. The Grapefruit League has existed since 1914. The consumption of grapefruit can play havoc with a number of medical drugs, either speeding up the effectiveness of the dose or even inhibiting some of the chemicals needed to be absorbed. The intensified potency of the medicine can be potentially life threatening. I’m no doctor, only playing one on TV, but I’d advise you little sippers to enjoy grapefruit cautiously if you are taking various meds and perhaps consult a physician to make sure it’s all good in the hood. Even more negative publicity for the fruit came in a July 2007 study published in the British Journal of Cancer (I guess everything has an outlet for recording their own thoughts), which stated that eating grapefruit everyday increased the risk of breast cancer by almost a third. This of course was refuted by two subsequent studies proving once again that everything in existence both causes and reduces the threat of cancer. 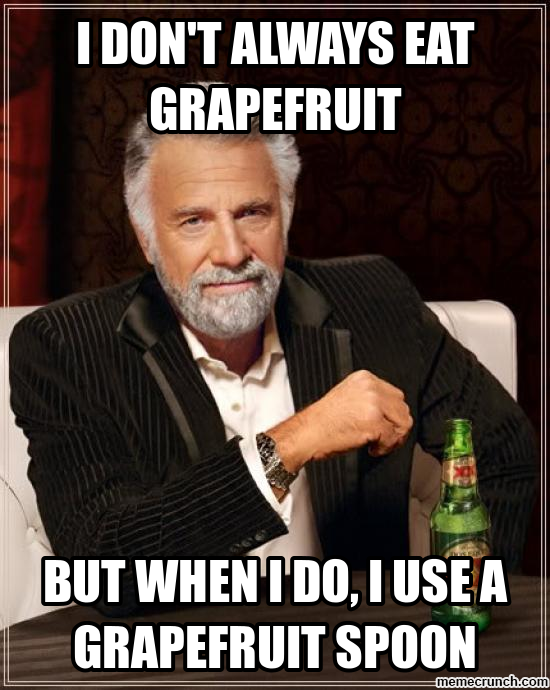 Enough about the bad, let’s see some of grapefruit’s benefits. First, because it doesn’t mess with a person’s blood sugar, it’s a great snack for diabetics. The citrus treat can also help in burning fat and is perfect for those trying to drop some pounds. Grapefruit is also rich in fiber, which can leave the eater feeling fuller longer and help with cleaning out one’s system. 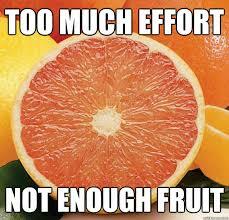 Don’t forget about all the vitamins and minerals coursing through the grapefruit. They can help with your immune system and energy level. In the Seinfeld episode ‘The Wink,’ George Costanza takes a blast of grapefruit juice to the eye, which in usual Seinfeld style, sets off a series of unfortunate events for the people that surround the main characters of the show. First, Kramer misinterprets George’s winking for giving him permission to sell a signed birthday card from the New York Yankees, meant for a sick child. Later, George appears to be winking when questioned by his boss on the whereabouts of a co-worker. The boss assumes that George is covering for the co-worker, who is promptly fired with George getting the position, which means longer hours, more responsibility and not enough pay increase to make up for the changes. Sticking with TV, in The Simpsons episode Das Bus (a parody of Lord of the Flies), the children become stranded on a deserted island after bus driver Otto gets grapefruit juice in his eyes and crashes, following an ill-advised bowling game by the kids, where Milhouse Van Houten rolls a grapefruit that gets stuck under the brake pedal. To this day, I still think Ralph Wiggum’s banana should have won the fruit race and I will be forever perplexed as to why he lost out. Grapefruit is also used in the film The Public Enemy, when James Cagney’s character Tom Powers, smacks a grapefruit into the face of his girlfriend Kitty (played by Mae Clarke). Director William Wellman added the controversial scene to the 1931 crime drama because his wife always ate grapefruit for breakfast and whenever the couple would get into arguments, he fantasized about pushing the fruit into her face to get a reaction out of her. Cagney has said that Clarke’s ex-husband enjoyed the act so much that he would buy tickets to multiple showings of the movie, entering shortly before the scene and leaving after. 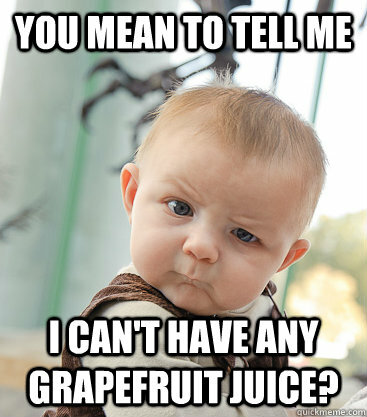 There are a number of grapefruit sodas available out there, although they may not expressly be called grapefruit sodas and are instead described as citrus drinks. Brands like Fresca, Squirt, Wink (funny name, given the Seinfeld episode mentioned above), Citrus Blast, and San Pellegrino will help give you some fizz if that’s what you prefer. I’ve recently come to enjoy grapefruit soda, especially over juices, and that reminds me… we have a drink to get to! Well, I hope you enjoyed hanging out with the Sip Advisor and learning about a fruit you never thought could produce nearly 1,000 words on information for it. Now go out and grab yourself a nice ripe grapefruit… so long as you have the necessary utensils and aren’t on any meds that may result in your death when combined with consumption! I feel, given the subject, that I should have added some grapefruit juice or soda to the recipe, but that may be saved for another time behind the scenes. 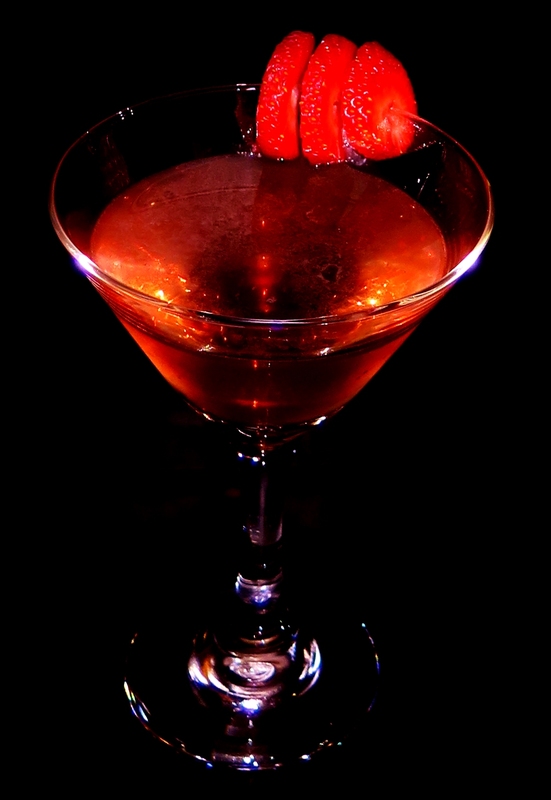 The recipe actually calls for Wild Berry Rum, but I went with Wildberry Juice to add a little mixer to the recipe. There is no heat to the drink, so I’m not sure where the name comes from, but it’s still a tasty martini. This entry was posted in Martini Recipes and tagged Barbados, Blood Sugar, British Journal of Cancer, Cactus League, Chinese Grapefruit, Chinese New Year, Citrus Blast, cocktail, Cosmo Kramer, Das Bus, Fiber, Forbidden Fruit, Fresca, Grapefruit, Grapefruit League, James Cagney, Lord of the Flies, Mae Clarke, Major League Baseball, Mango Rum, martini, MLB, San Pellegrino, Seinfeld, Squirt, Strawberry Slices, Sweet Heat, The Public Enemy, The Simpsons, The Wink, Wildberry Juice, Wink by Daniel Wilson. Bookmark the permalink.